The design for the new Salvador Dali Museum which will be located on the waterfront in downtown St. Petersburg, Florida was revealed at a City Council meeting yesterday. The design, by HOK's Tampa office, appears to be a minimal white box that is being attacked by a glass blob dubbed "The Enigma". The preliminary design was approved by Council. 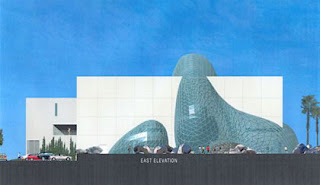 Construction should begin this fall with the new museum opening in 2010. See the story in the St. Petersburg Times. I plan to be involved on Saturday's event at Gaslight Park in Downtown Tampa. If you want to help, please flag me down. If not, please check out this and the other events. Also, I have set up an online petition to designate Kiley Gardens as a local landmark. In addition to that, I am handing out hard copies of this petition (available through the events and Cafe Hey). Please take a few seconds, (literally) to sign it. After ECO.lution, my goal is to take a record of this, in addition to the hard petitions, to our mayor. Tampa is now included streetview. No need to get out of your car. You can now experience most of Tampa, St. Pete and even Valerico on Google streetview.